The Cooleemee Plantation House, located off Highway 64 between Mocksville and Lexington, North Carolina, was recognized as a National Historic Landmark in 1979. A memorial plaque from the U. S. Department of Interior and State of North of Carolina is located at steps leading to the house. Cooleemee was under construction from 1853 to 1855 and represented a complete departure from any prior architecture of the area. It was designed by New York architect W. H. Ranlett and called "An Anglo-Grecian Villa" by Godey's Lady's Book. The house was built in the shape of a Greek Cross with four equal wings radiating from the hall, which has a fine spiral stair ascending in wide, sweeping curves to a high glazed cupola on the roof. The dimensions of the house in comparison with other house of the era are immense. It is fifty-feet high and required well over 300,000 bricks on top of massive stone foundations. The bricks were burned in a kiln set up on the plantation, and stonemasons cut foundations and gutters of native rock. The cost was $10,438.31. 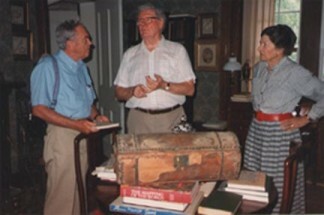 The house contains a fine collection of 18th and 19th century furniture, china, etc. - some brought by the first Peter Hairston from Virginia, some ordered in 1855 by the builder of the house. The grounds at Cooleemee were landscaped in broad terraces to the river, with double walks of English boxwood, stone gateposts and a wrought iron fence. The outbuildings consisted of a smokehouse, separate kitchen, dairy, icehouse, carriage house, office, stables and milk barn, chicken house, granary, corn crib and kennel. Major Peter Hairston, who had served in the American Revolution from Henry County, Virginia, acquired the land for Cooleemee Plantation. In 1817 he bought two tracts totaling 2,570 acres from General Jesse A. Pearson for $20,000. These tracts were already called Cooleemee. On a military campaign against the Creek Indians, Pearson had camped with an Indian by that name and so named his home. 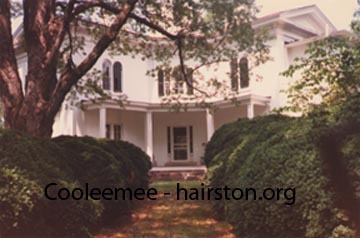 Cooleemee received recognition as a National Historic Landmark because of its architecture and because the Hairston family has owned it since 1817. Robert Ervin Hairston, Judge Peter Hairston and wife Lucy. The late Judge Peter Hairston wrote an excellent book on the history of this plantation, "The Cooleemee Plantation and its People", Hunter Publishing Company, 1986.